Featuring Two Time Polka Ray Barron, this is a smoking hot Parisian Gypsy Jazz Band making their DeBarra's debut! Formed in early 2013 Rue du Canal was created as a vehicle for performing the compositions of legendary French accordionist Serge Desaunay. Serge started off playing with La Chiffonnie a groundbreaking French folk group of the 70’s. After that he spent several years playing music with his brother Patrick. Après La Pluie (1979) and Le Beau Temps (1984), the two albums released by the brothers, ...are regarded today as milestones in French folkmusic. While mainly concentrating on Serges compositions, Rue du Canal also traverses the musical styles of musette and tango. Rue du Canal also includes Ray Barron on mandolin/mandola, Kieran Fahy on fiddle and Gaspard Vanardois on guitar/ Arabic oud. Kieran originally from Tuam, County Galway has been living in Belgium since 1983. At present he tours regularly in France, Holland and Belgium with his band Shantalla. He has recorded on over 30 CD’s to date. Kieran also contributes some of his compositions to the mix. Ray has been playing music for over 35 years. He has toured all over Europe, USA, Australia and New Zealand. He is renowned for his dexterous and exciting mandolin playing. Ray has recorded four albums with his group Two Time Polka and continues to tour and play with the band on a regular basis. 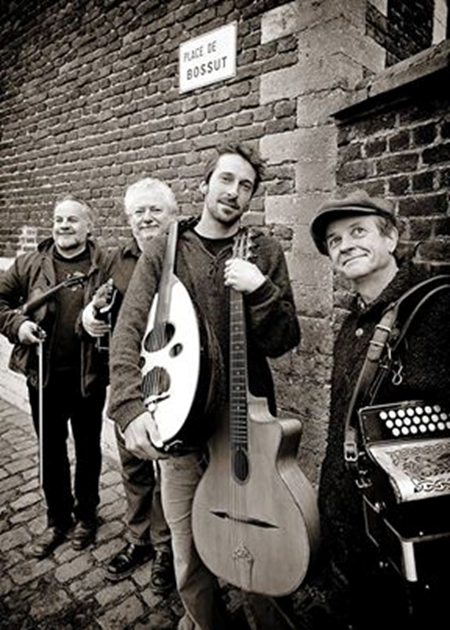 Gaspard has played with Serge in their Eastern European styled gypsy band Taraf Borzo. His guitar playing drives the whole combination along with its gypsy swing type accompaniment. Gaspard also plays the Arabic oud which brings an exotic taste of the East to the band. Rue du Canal, featuring Ray Barron (Two Time Polka), is een bloedhete Parijse gypsy-jazz-band die haar DeBarra�s debuut maakt! De band werd in 2013 opgericht met als doel de composities van de Franse accordeonlegende Serge Desaunay te brengen. Serge begon zijn carriere bij �La Chiffonnie�, een baanbrekende Franse folkgroep uit de jaren �70. Serge Desaunay, raison pour laquelle ce groupe s’est formé en 2013. Depuis une trentaine d’années Serge est une référence pour l’accordéon diatonique en France. Dès 1970, il débute avec le groupe « La Chiffonie ». Ensuite il fonde avec son frère Patrick le « Trio Desaunay » . Leurs deux enregistrements « Après la Pluie » et « Le Beau Temps » ont marqué leur époque. des musettes ,,, Un spectacle au riche univers. Les deux Irlandais du groupe sont le violoniste Kieran Fahy (Shantalla, Hot Spoons ) et le mandoliniste Ray Barron (Two Time Polka, Hank Wedel). Quant à la France, elle est présente avec Serge Desaunay à l’accordéon (Taraf Borzo, La Chiffonie) et Gaspard Vanardois à la guitare et à l’oud (Taraf Borzo, La Panika). Quatre musiciens de renommée internationale qui tournent partout en Europe avec leurs groupes respectifs. « Rue du Canal » a enregistré son premier CD en 2013 : « 1ere Etage ». Rue du Canal ist eine heiße Gypsy-Jazz-Band aus Paris, mit als Gast Zusatz Ray Barron (Two Time Polka), die ihren DeBarra’s Eintritt macht! ‘La Chiffonnie’, eine bahnbrechende französiche Folk-Band der 70-er Jahren. Danach gründete er und sein Bruder Patrick die Band ‘Trio Desaunay’. Ihre Platten ‘Après La Pluie’ (1979) und ‘Le Beau Temps’ (1984) werden weiterhin als Meilensteine der französichen Folkmusik betrachtet. Die Band konzentriert sich hauptsächlich auf Serge’s Kompositionen aber auch Stile wie Musette und Tango werden gespielt. Rue du Canal besteht also aus Serge und Ray (Mandoline/Irland), Kieran Fahgy (Geige/Irland) und Gaspard Vanardois (Gitarre/Frankreich). Kieran kommt aus Tuam, County Galway, lebt aber in Belgien seit 1983. Jetzt geht er regelmäßig mit seiner Band ‘Shantalla’ in Frankreich, die Niederlande und Belgien auf Tour. Er hat schon über 30 CD’s aufgenommen. Ray hat während seiner 35-järigen Musikkarierre schon in ganz Europa, die USA, Australien und Neuseeland aufgetreten. Er ist vor allem um sein aufregendes und agiles Mandolinenspiel bekannt. Mit Two Time Polka, die Band mit der er noch immer häufig auftritt, hat er vier Alben aufgenommen. Gaspard hat zusammen mit Serge bei ‘Taraf Borzo‘, eine osteuropäisch beeinflußte Gypsy Band, gespielt. Sein Gitarrenspiel leitet die gesamte gypsy-swing-gefärbte Gesellschaft. Er spielt auch die arabische Gitarre, die die Band dann wieder eine östliche exotische Note besorgt.